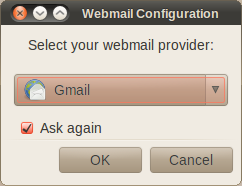 Webmail for Linux Desktops provides a generic mailto: handler and webmail config dialog that lets the user choose his preferred webmail provider on first run and through the desktops Preferences->Webmail facility. What repository is this app in? Is it available on Karmic too? Over a year I provided feedback to Zoho that Ubuntu/Canonical should work together to provide a smooth office experience because is fantastic. I mainly haved used their Mail and Writer apps and they are excellent. Zoho is making constant improvements and for me Zoho is quicker to login and logout than Gmail is. Their intergration is very good. Oh, They have a nice brown theme which matches my Ubuntu theme perfectly. I hope that Ubuntu/Canonical will strengthen the bond. Nice, is it works for Free Yahoomail account? I’ve got it installed now and everything, but doesn’t really work, still tries to open evolution every time I click on a mailto link. Go to System –> Preferences –> Preferred Applications and set “Mail Reader” to the new “Desktop Webmail” application. 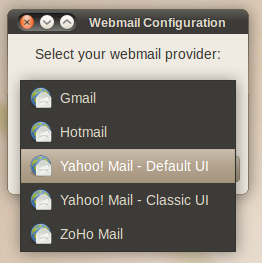 Can it be set up to work with custom webmail clients ie zimbra? No support for file attachment. Right click a file in Nautilus or wherever, often there is a “send as email” link. File not attached. Bug.